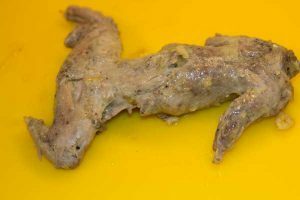 Way back in 2008 I published an article: “Help save Tufty…eat a grey squirrel”. Despite being keen to try (almost) anything once, Mr Not Delia and I never really had an opportunity to do so. We’re not licensed to kill – the only weapon we own, beyond chef’s knives, is a water pistol – and we never saw any grey squirrel meat on sale anywhere from any butcher, even those who routinely sell game. 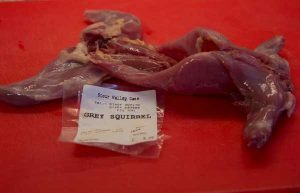 Funnily enough, our local fishmonger sells game too but, to the best of our knowledge, grey squirrel isn’t on his bill of fare. Admittedly, we’d never thought to ask. We’d pretty much forgotten about the whole idea of eating squirrel when we unexpectedly came upon it for sale at Elm Court farmers’ market in Kent recently. Whilst finding lots of unusual products at the market, we also encountered the Stour Valley Game stall run by the very friendly and helpful game dealers, Daran Byrom and Stephen King. These guys really know their stuff and are completely unfazed by, and patient with, customers who are new to cooking some of their products. Among many other things, including the usual rabbit and venison, we were surprised to see that they also had grey squirrel on offer. Well. After what we’d said before, we felt duty-bound to buy and try. 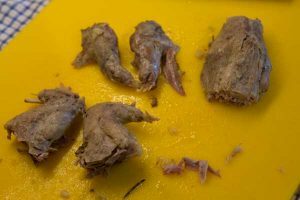 I’d expected it would taste a bit like rabbit, which we think is nice but not our favourite edible animal, not least because it’s hard work picking the meat off the bones, especially from the saddle. I suppose we bought the squirrel for the novelty factor as much as anything and didn’t expect any amazing new taste sensation. How wrong we were! It was one of the most delicious meals we’ve had in a long time. This was all very well but, having bought the beastie, I was a bit unsure what to do with it. 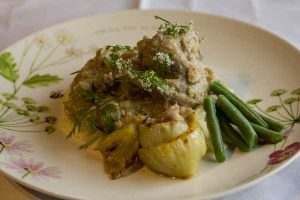 And there are not very many places online, or indeed in my vast cookbook collection, to find squirrel recipes – excluding Southern fried, home-cooking style, and that wasn’t exactly what I’d had in mind at the time even though we love Southern fried chicken. 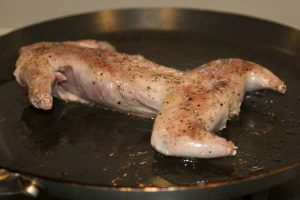 Given that the whole squirrel carcass looked pretty much like that of a rabbit, and that it was wild and likely to benefit from slow cooking, I changed tack and looked for rabbit recipes to adapt. There was no shortage of them. The River Cottage Cookbook in particular had some good advice about the preparation and cooking of grey squirrels, including the advice that any good rabbit or chicken recipe could be adapted for squirrel, so I figured I was on the right track. I decided to go for it served on a bed of mashed potatoes, along with sautéed fennel, green beans with some chervil (including flowers) from my herb garden. Here’s a step-by step photo guide. I think realistically you’d need one squirrel per person. There’s not a lot of meat on them. However, we found that one squirrel was enough for the two of us, especially as I’m not a big meat eater. If I was serving this at a dinner party, I’d most likely only serve the hindquarters to the guests and save the other meat for later – the saddle especially is too bony for a dinner party. I browned it in a frying pan with a little oil and some freshly ground black pepper prior to putting it in the slow cooker. Browning occurs because of the Maillard reaction, which is known to improve flavour. 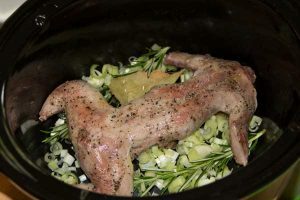 Next I put the browned meat in the slow cooker on top of a bed of leeks, some sprigs of rosemary from the garden, a couple of chopped cloves of garlic, a bay leaf, and some cider. Then I cooked it on low until the meat was tender – around a couple of hours. 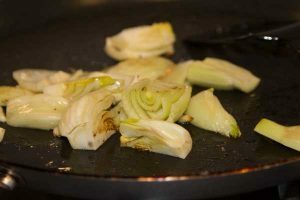 While the meat was cooking, I quartered some small fennel bulbs and added them to the pan in which I’d browned the squirrel. I added some butter and pastis for extra flavour. Once the meat was cooked, I removed it from the slow cooker ready for jointing. I kept back the stock/gravy to pour over the dish later. Next I jointed the cooked meat into its hindquarters, forequarters and saddle. Finally, I plated it up. Though I say so myself, it looked pretty good. More importantly, it was very tasty!